For now, there is no separate WordPress plugin. However, our latest WooCommerce plugin can generate a shortcode that you can place anywhere into other WordPress pages or posts that support inserting a shortcode in general. The shortcode integration supports all features including hotspots, 360-degree product views, videos from YouTube, Vimeo and mp4 sources, and the fantastic 360 product tours. You can create the hotspots and 360-product tours via corresponding AJAX-ZOOM editors, which are integrated into WP-backend. So install WooCommerce, create a "dummy" WooCommerce product, and you are ready to go. Under a "dummy product" is meant that you do not necessarily need to operate a real shop on your WordPress website. You can install the free WooCommerce plugin, disable the "Shop", "Cart" and "Checkout" menu pages. 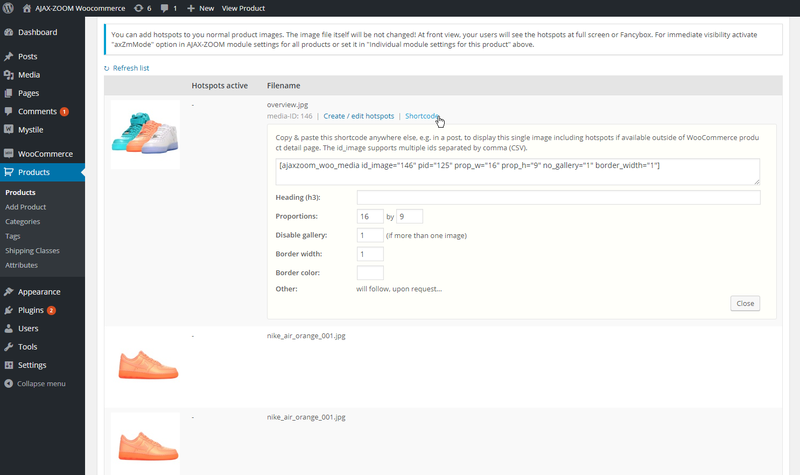 After, you are still able to use the AJAX-ZOOM plugin for WooCommerce to manage the 360 images or images that you would like to show in AJAX-ZOOM viewer. 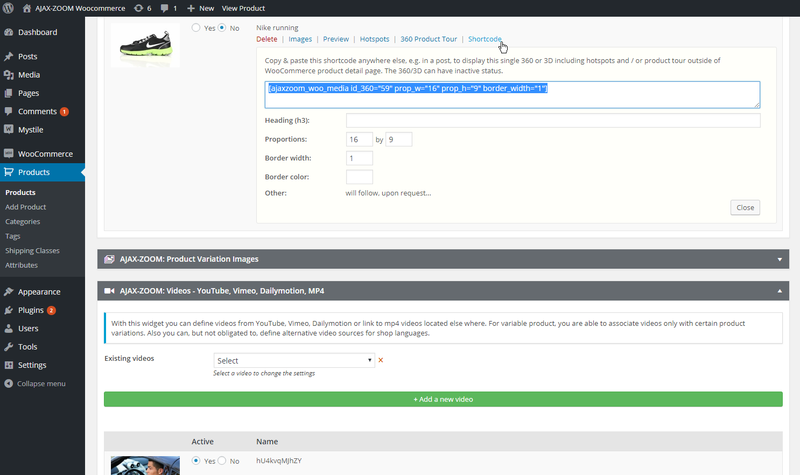 As you can see in the screenshots below, there are possibilities to copy shortcodes for any media items such as 360 / 3D product views, large images or videos. You can copy the shortcode that includes all items of a particular "product" and shows in frontend with a thumbnails gallery of those items. Alternatively, you can copy a shortcode that displays those single items separately. So if you are just looking for a sophisticated 360 product viewer for your WordPress pages, the AJAX-ZOOM plugin qualifies for this requirement in full. If you are looking for a well-elaborated deep zoom viewer for your WordPress pages, you have found it here as well. If farther on you decide to create clickable hotspots or turnable product presentation, you will hardly find any better alternatives for this plugin. By the way: you can place hotspots on regular images and 360 images. The editor supports both! The integration in the frontend uses this example as the codebase. This is an AJAX-ZOOM extension that has tons of options and features. 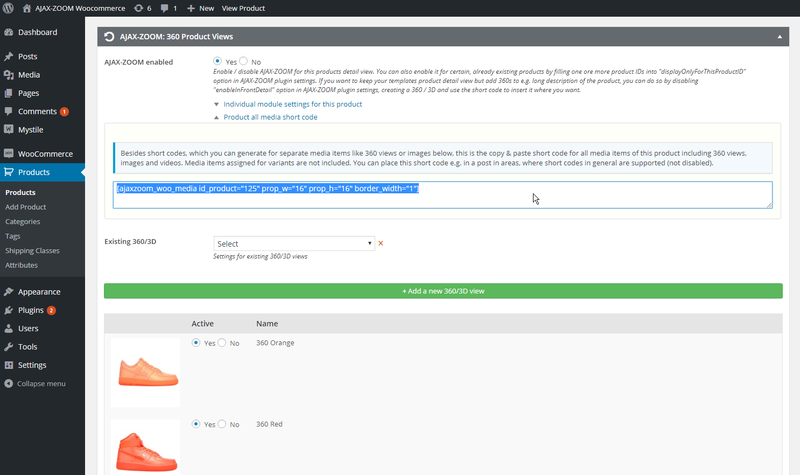 You can configure the options individually for each "product" or globally for all "products". Again, if you are interested in only integrating the AJAX-ZOOM viewer without operating a real shop, you can consider a "product" as a set of media items that you want to display in the viewer. You can build all the features that are present in this example via the AJAX-ZOOM tools, all of which are part of the WP backend after you install the plugin. So you can use all those features without any programming knowledge. 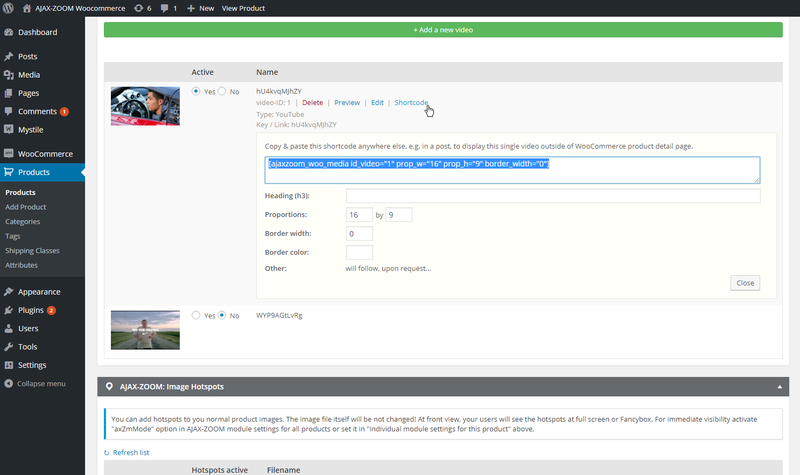 There is nothing more needed than being able to copy a shortcode and paste it in a WP-post. Install WooCommerce plugin, disable or delete all menus like "Shop", "Cart" and "Checkout" in case you do not operate a WooCommerce shopping cart. Install AJAX-ZOOM plugin for WooCommerce. All installation steps and requirements are available on AJAX-ZOOM plugin for WooCommerce page.